tamim, formerly known as Mistake, is a Smash 4 Canadian Bayonetta main with a strong Zero Suit Samus secondary from Southern Ontario. 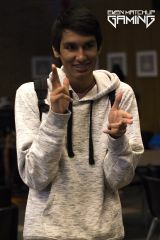 Formerly a solo Zero Suit Samus main and was considered the best Zero Suit Samus and Peach player in Canada, he later picked up Bayonetta and has become one of the best Bayonetta players in the world, along with Tweek, Salem, Lima, CaptainZack, and Abadango. He has taken sets off top level smashers such as ZeRo, Tweek, Dabuz, Nairo, Salem, Cosmos, Mr.R, CaptainZack, komorikiri, and VoiD. He is currently ranked 1st on the Southern Ontario Smash 4 Power Rankings and the Canada Smash Ranking as well as 25th on the Panda Global Rankings 100. On August 11th, 2017, tamim announced he was now a player for Even Matchup Gaming. tamim has a younger brother, Slayonetta, that is also a Bayonetta main. tamim announced his retirement from competitive Smash Bros. on March 22nd, 2019, citing predatory conduct of multiple Smash top professionals and general community dissatisfaction as reason for his retirement. Along with CaptainZack and Lima, tamim has a negative reputation for being one of the "villains" in the Smash community due to maining Bayonetta as well as being considered "disrespectful" when he plays the game. This has led to some disrespecting and harassing him, such as being booed when he plays, this has resulted in drama in the community. On March 22nd, 2019, tamim posted a series of tweets in which he criticized Smash's competitive scene and players, most notably singling out Ally for allegedly engaging in a sexual relationship with a minor (a claim that was subsequently refuted by both parties), and StaticManny for allegedly being a sexual predator, providing screenshots as proof. This caused some controversy, with various smashers such as Alpharad leaving the competitive scene in response to the event, along with similar outbursts from the community's players. Since then, tamim deleted his public Twitter account. While a few reports were eventually revealed to be fabricated, on April 21st, 2019, RiotLettuce had confirmed after an investigation that most of the reports pertaining to StaticManny were indeed accurate, with the CFL panel deciding to issue a tournament ban on Manny from any CFL events until CEO 2019. ↑ Regarding Manny at CFL events. This page was last edited on April 22, 2019, at 09:00.